No food this Friday. UGH...I made a beautiful pot of chili last night to celebrate the first chill of autumnal weather here in the tropical south and totally forgot to take a photo. There was a tiny bit left over after sharing some with our contractor so I will try to snap a picture later today. I do have a card and a peek at what's happening in the master bath. 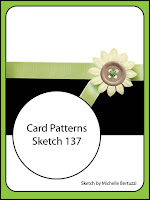 I used the sketch from Card Patterns CPS137. This card was made using Creative Imaginations Paint It DP and Die Cuts and Twinkling H20's. The sentiment is from Rubbernecker Stamps. The Mustard Green matched that gorgeous May Arts ribbon perfectly and I so love the shimmer. I almost felt like an artist swiping my brush across the paper...almost! Ok, here's a sneak preview of what's happening the bathroom. I'll show you a before and after so you can see the difference. This is the old shower area on the left before. The almost completed shower and the new tile....we're getting there! Don't forget to leave a comment for my May Arts/Core'dinations/Petaloo giveaway. I'll draw the winner tomorrow. Love the card...the music theme is perfect! LOVE the glass block...lookin' good! your card is so beautiful... Love it..
progress in the BR...looking good..
Wow, what a gorgeous card! Love the simple color scheme and all those layers. So glad you could play along with us on Card Patterns this week! What???? I came for my Friday snack/fix! LOL...pretty card and your bathroom is shaping up nicely as well! Hope it is finished soon, seems it has been going on for a while. Love how you put those papers & paint to work!!! Absolutely beautiful!! Love the colors and your design is totally fabulous! Thanks for joining in the fun at Card Patterns!